Is It Really A Tax Cut? My first take on the state income tax cut agreement between Gov. Mary Fallin and some Republican legislators is this: It’s an awful plan that primarily benefits the wealthy as it reduces available money for education and other core state services. Legislators should reject it. 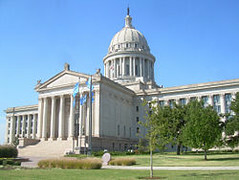 In addition, it appears some Oklahomans will actually pay more in taxes under the plan. How does a supposed vaunted tax cut actually raise taxes? It’s a contradiction the GOP and probably many rich Oklahomans don’t want anyone to point out too loudly. The plan would reduce the top income tax rate from 5.25 to 4.8 percent. It eliminates the personal $1,000 exemption for taxpayers making more than $35,000 a year ($70,000 for a couple) and their dependents and includes a trigger to drop the top rate to 4.5 percent in 2015 if revenues increase by 5 percent the previous year. Again, this is my first take on the agreement, but the numbers don’t add up. It’s simple math on a calculator. By losing the personal exemption some people are going to pay more because the actual tax “cut” doesn’t make up for it. How can you even call this a tax cut and get away with it? Taxpayers will also no longer be able to deduct their state income tax as an itemized deduction, which will also help to raise taxes on some people. Also, those people with incomes between $12,000 and $14,000 would actually see their tax liability increase, according to a media report. So essentially people with incomes of $150,000 to $499,000, according to an Oklahoma Tax Commission analysis, would benefit the most from the tax cut while everyone else gets a small decrease or small to large increase in what they pay in state taxes. It’s class warfare waged by Republicans on behalf of wealthy people. What else is new, right? The proposal would mean the state will have $32.7 million less in available revenue for fiscal year 2013 and $102 million less the following fiscal year. This comes after years of state budget cuts, but the Republicans claim the tax plan protects core services. Obviously, the plan is less drastic than Fallin’s initial call for a drop in the top tax rate to 3.5 percent, but it’s still irresponsible. It’s based on the proposition that businesses will flock to Oklahoma because of its reduced state income tax rate. That’s not going to happen, and everyone knows it.